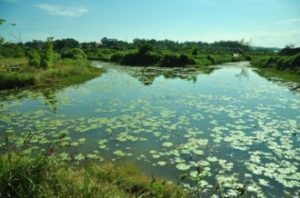 Spanning about 60 acres, the Thalawathugoda Wetland Park is located within a highly urbanized area in the proximity of the Parliament Complex in Sri Jawardenepura, Sri Lanka (within Greater Colombo). Originally this park was a paddy land and in late 1970s the area was used to deposit the dredge material of the newly created parliament lake. At present it serves as a flood detention area, absorbing rain water during heavy storms and protect the parliament area from being inundated. Some of its other benefits are lowering the city temperature, providing a place for students to conduct biodiversity studies, and providing a recreational area for lovers of nature. 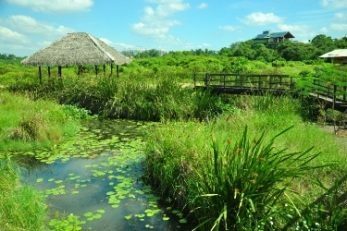 This wetland park serves as refuge to many different animals and marshy plants, especially a temporary home for several migratory birds. 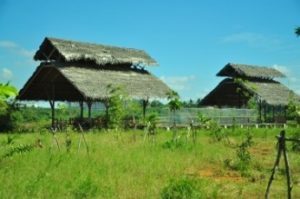 More than 50 species of birds, over 25 butterfly species, many types of fishes and dragonflies have been recorded from the site. The most interesting species found in this park are fishing cat (globally and nationally threatened), otter and the estuarine crocodile. The Purple-faced leaf monkey, a long-tailed arboreal languor endemic to Sri Lanka is also seen at Thalawathugoda. This park is an important location in Colombo to spot Fishing Cat.